At the 2016 Detroit Auto Show, Acura unveiled their weapon to battle against the Lexus and Infiniti. 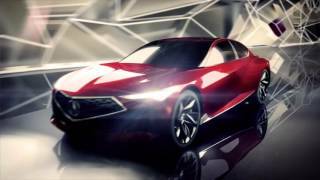 We are here talking about the Acura Precision Concept 2016. Featuring a sportive body with curvy lines, the concept is anticipated to roll the dices in favor of the company; only if it comes as production model (something certain). 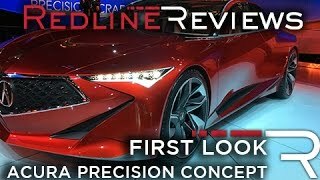 However let us go ahead and take a look at the review of Acura Precision Concept 2016 to know in detail about it. The interior of Acura Precision Concept 2016 is a remarkable sneak into the future. Let us start with the double-layered dashboard which has a tablet like touchscreen above the sportive steering wheel. This symbolizes that you won’t be getting the traditional instrument cluster. Thus the main display now gets replace by a massive screen running all above the center stack. Talking about the center stack, it has a slim display and three control buttons for drive, park and reverse. The entire interior comes drenched in leather. Primarily the leather work is of two colors reddish and white. The former blend can be noticed over the upper dash and seating surfaces and steering wheel while the latter one can be noticed over the lower part of the dashboard, seatbacks and center console. 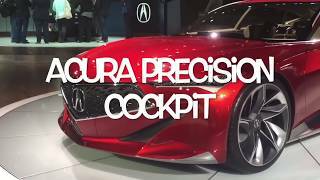 Before concluding the interior details of Acura Precision Concept 2016 I would mention the newly designed Acura’s digital human-machine interface (HMI). The system will be found inside the model and will give a new experience through a center mounted massive screen and the floating touchpad. Just like the interior, the exterior of Acura Precision Concept 2016 is company’s futuristic approach. Starting with the front fascia it has the sharp ‘Diamond Pentagon’ grille amidst the LED headlamps that mark their way till the wheel arches and give the concept an impeccable touch of aggression. You can also notice sharp creases over the hood and the front apron that further add to the aggressive stance. Moving towards the rear end, there is a set of slender taillights over the beefy edges. The rear bumper gets a sportive look and massive exhaust outlets making the entire rear look more sportive. 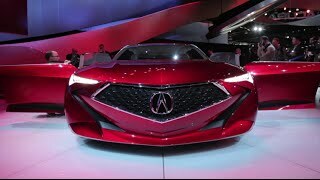 In all rolling over the bulky 22-inch wheels, the entire exterior of Acura Precision Concept 2016 looks highly aggressive, futuristic and sportive. Team Acura didn’t share any update in terms of power output of Acura Precision Concept 2016 but expect a powerful V6 or V8 beneath the hood. 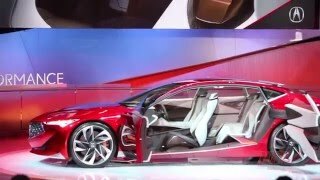 The assumption is totally based upon the body design of the concept while the performance figures of Acura Precision Concept 2016 are also expected to be high. However nothing can be said till the time we have any detailing from the side of the company.